For sports fans, watching games and events on TV is fun – but being there in person is the real deal. While many fans are able to go to the games of their local teams on a regular basis, it takes a special trip to experience some of the biggest events in the world of sports. If you are going to fulfill your dreams as a sports fan, you will need to establish a game plan for traveling the country (or the world) to find a seat close to the action. So what sporting events should be on your fan bucket list? Well, the Kentucky Derby for one. The Derby is a huge event, with more than 170,000 attending the race at Churchill Downs in 2015. Obviously, the Super Bowl qualifies for this list as well. Even if you aren’t a huge football fan, or a fan of either of the teams that are playing, just the spectacle of Super Bowl week alone is worth a trip. Other events that are worth of your time and attention include The Masters, Wimbledon, The Boston Marathon, the Stanley Cup Finals, and the Olympics. Each of these events is tremendously popular, so you will need to plan ahead to find tickets, accommodations, and more. As you might expect, taking a trip to these events is not going to be a cheap proposition, as tickets can be costly and the price of hotel rooms will go up around the time of the event. 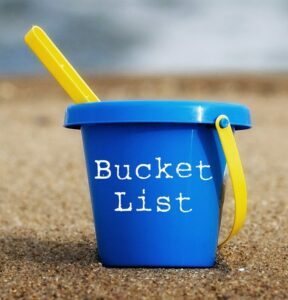 However, if you have the money available, a trip to a few of these bucket list events will be something that you never forget.